Whether you already have a business or just an idea, a business plan is essential. Even if you’re not considering raising money for your business, a plan will help you guide your strategy in production, marketing and management. If you’re looking to fund your business, a business plan is a must for building credibility with investors and supporters. Your plan is going to be the first step in developing your idea and the last step before you take your business to investors for funding. But a business plan is more than just writing out your idea. It’s a detailed, formal document that can take weeks and even months to complete. It’s also a part of being an entrepreneur for which most people aren’t prepared. That’s why I wanted to put this guide together. I’ve been on just about every side of the table when it comes to new businesses. I’ve created and sold businesses as well as bought companies from founders. I’ve also worked as an equity analyst, counselling buyers on the right price to pay. 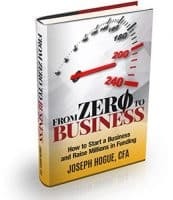 This post is an excerpt from the book From Zero to Business, a step-by-step guide to business planning and funding. 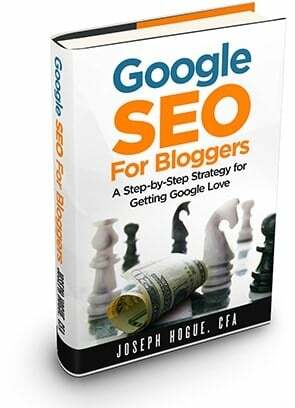 In the book, I start by giving you all the tools to plan out your business before detailing a four-stage process to raising millions in funding. In this guide, you’ll get started with understanding how to start a business plan including the critical steps to writing yours. Need a loan to get your business going? Lending Club offers small business loans of up to $350,000 for owners in business at least two years and with $50,000 in annual sales. Rates start from about 10% but you don’t need collateral for loans under $100,000 and terms are up to five-years. People usually ask me how to make a business plan just as they are getting ready to seek funding for their business idea. Too late! While a business plan is absolutely necessary for funding, it’s also a way to define and refine your business strategy and goals. Writing out a plan forces you to look at everything separately and then how it fits together; from market needs to costs and plans for the future. The best part about a business plan is that it’s a ‘living’ document. Write out a business plan ahead of your launch to know what you’re getting into and set your first year’s goals. 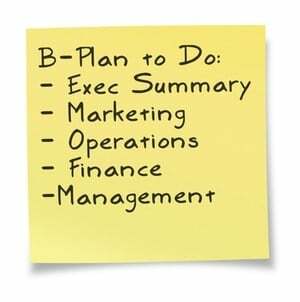 Revisit your business plan every six months to a year for improvement and reflection. 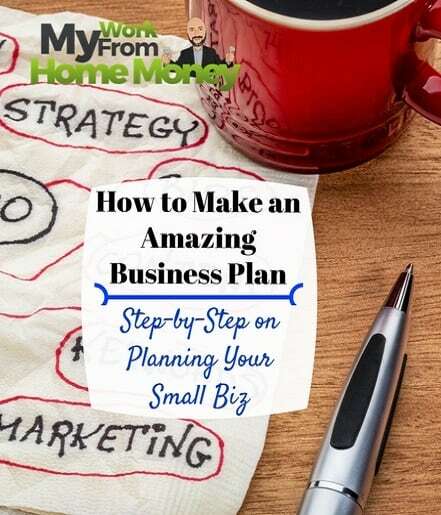 There’s no rule to how long you should make a business plan but around 25 to 40 pages plus another ten pages or so for appendices should be enough to get the detail you need. If a picture is worth a thousand words, a chart or graphic in your business plan is pure gold. Putting as much of your numbers in graphics will break up the monotony of reading, express your best points and cut down on the bulk of your business plan. Investors will appreciate it and it will help you visualize how your business will grow and how you plan on reinvesting for business growth. Avoid buzzwords and jargon when making your plan. Include any necessary technical notes in an appendix if people want to read them. Most likely, the investors within your sector that know the technical side will not need it and those outside the sector won’t want to read it. 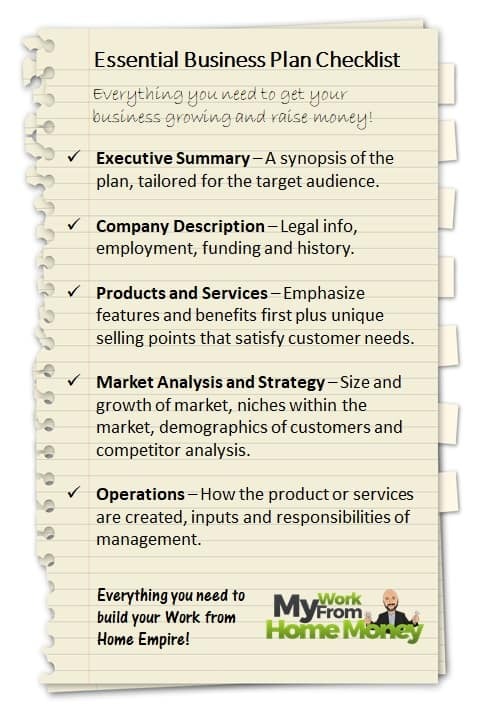 Most business plans contain seven core elements including a one-page executive summary. One of the biggest reasons businesses fail is because entrepreneurs get bogged down with little details that they forget to plan for the larger ideas. Writing out your business plan will help you focus on these broader ideas. This first section will include a lot of the legal description for your company like in which state you are based and your legal status. You’ve got the option of incorporating, forming a partnership or remaining as a sole proprietorship. Corporations offer protection of your personal assets against business creditors. If your business runs into trouble, you won’t have to worry about losing your home or being personally liable. Corporations can issue stock and may be able to lower the owners’ tax bill by holding profits in the company. Corporations generally have stricter filing requirements and must hold an annual meeting of owners. Corporations also must pay corporate income taxes. Partnerships and Limited Liability Corporations (LLC) are like a type of corporation but still retain some benefits of a sole proprietorship. There is no limit on the number of owners and the profits flow directly to your individual tax returns, avoiding corporate taxes. There are also no requirements for annual meetings. These business may not be able to issue stock and may have a more difficult time raising investor capital compared to a corporate structure. Many businesses and franchise opportunities will fall into this category. Sole Proprietorship is the easiest business structure to form, basically just starting your business under your own name as the owner. There are no filing requirements as with LLCs or corporations and you won’t need to pay corporate income taxes. The downside is that you can be held personally responsible for any business debts and can be sued for something you do as part of your business. Non-profit corporations may avoid corporate taxes if the company is approved by your federal revenue service. The company description will also give a brief history of the business, when it was formed and different business names under which it has operated. Include geographic markets in which you operate, both for production and sales, as well as how many employees work for the company. You’ll wrap the section up with the goals, mission and vision of the company. Vision is a statement of what the company wants to be in the future. It is a little more esoteric including a philosophical vision of the ideas and values the company wants to project. It can be as short as a sentence like Nike’s, “To be the #1 athletic company in the world,” or much longer as with Coca Cola’s vision within each idea of profit, people, portfolio, partners and planet. This section lays out your actual product or service as well as the supply chain involved. What raw materials or other supplies do you need? How much manufacturing or finishing is involved in production and how does your product get to the final customer? How many distinct products do you sell and how are they related? What patents or trademarks does the company own or will it need? This is also where you will talk through the specific needs of your potential customers and how your product satisfies them. Go deeper than just superficial needs to the emotional needs your product fulfills. A luxury fountain pen isn’t just a writing instrument, it’s a symbol of success and an expression of art in writing. Spending some time thinking through this section will help you develop your business idea and provide ideas for marketing. This is where most people jump to when making their business plan. It not only answers the ‘why’ of overall customer demand and how your product fills a need but how you’ll get your product in front of people. How big is the market in which you want to sell your product? This is how many people buy the product and how much is spent annually. You could estimate the potential market size if you’re creating a totally new product or service but try to relate your new business to an existing market. Even a totally new market will be related to an existing one, most likely a small niche part of the older market. Try to be as specific as possible in the niche market in which you’ll operate. Defining your niche helps to better understand your specific customers and the potential for sales. A new business can’t be all things to all people. In the example above, it would be impossible for a new business owner to address all the needs of the general TV-viewing public. Even the behemoth Disney corporation is segmented into different divisions to operate in different areas of entertainment. Investors will want to see a niche market large enough for strong sales but small enough that you can address specific needs. Are more or less people buying the product and what are sales trends over the last few years? There’s nothing wrong with breaking into a declining market but your product will need to be exceptional. Within your niche, who are your potential customers? Develop a target customer profile including age, income level, family size, marital status, interests and hobbies. What is the buying pattern around your product? Do customers buy it once every few years or more regularly? When a customer needs the product, how urgent is their decision? What are the legal and regulatory requirements within your market? Don’t think that you’ll be able to get around state and federal regulations because of your business size. Understand filing costs, permits and the inspection process and how much everything will cost. 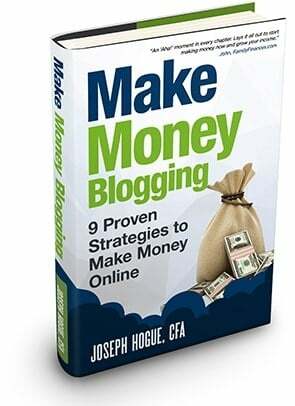 You will also want to research how regulations are developing within your market. Are product or safety requirements becoming more strict or costly? Is the market heavily regulated but about to be privatized? What drives purchases for your product or service? Is it mostly driven by population growth or some kind of customer demographics? Your growth drivers may be specific to the niche in which you operate. A luxury niche within a larger market will be driven by disposable income growth while the low-cost niche may be driven by other economic factors. How are products differentiated within the larger market and down through your specific niche market? If products are not differentiated, like the market for agricultural products, then it is a commodity market and you’ll have almost no ability to set your own price. Products can be differentiated by brand, extra features or service. What are the price points for products in the market? Do some companies sell their product for premium prices because of their differentiation? Where will your product fit within the pricing scheme; in the premium segment or the low-cost segment? Don’t immediately think you’ll break into your market by offering the absolute lowest price. Existing companies competing on price already have loyal customers and momentum in their marketing strategy. Enter the market at a lower cost and they can just as easily lower their own prices until your profit evaporates. In my experience, it is usually better to start your business from a position of differentiation than to be a cost provider. Market your product as something better with special features relative to existing businesses. Your competitors will have to imitate or improve on your special features to take your customers, something that will be much more difficult compared to just lowering prices. Competitor research is some of the most productive time you’ll spend while developing your business plan. Know you competition inside-and-out will help to understand where you fit in the market and if there’s really an opportunity or you’re heading for disaster. How do competitors promote their products? How much of the market does each competitor control? Does one competitor dominate the market or are sales spread out more evenly? What do your potential customers think about each competitor? Don’t just assume this from your own point-of-view, ask them! What is each competitor really doing well? How much does it cost them to produce their product? How is each competitor falling short? Check out Porter’s Five Forces, it’s a way of looking at competition in your market taught in most graduate business schools. Porter’s Five Forces separates a market into five aspects (or forces) that influence competition. Buyer Power – How much choice do customers have to fulfil their need for the product? Do a few customers buy in bulk or are there many customers with smaller orders? Is the customer demand highly subjective to prices or is the product a necessity? If buyers or one particular buyer have a lot of power then the market will be limited on price control. Buyers of cable TV services have almost no power because there are so many and single purchases are relatively small. Cable service operators can charge higher prices and change service agreements easily. Supplier Power – The flip side of your customers’ power is how well do suppliers control the market for inputs. Can you get your resources from one of many suppliers or are you dependent on a few? Do you need one specific item or can you substitute it with something else as an input to your product? Threat of New Entrants – How easy is it for new competition to enter the market? Are there regulations that limit new competitors or do high start-up costs keep people out? Obviously if there are high barriers to entry, you’ll need to address how you plan on getting in the market. Once you’re in a market with significant barriers, you might be able to charge higher prices and won’t have to spend quite as much on marketing. Competitive Rivalry – How many competitors are already in the market and do products differ much? Are customers loyal to one brand and does it cost much to switch to another brand? Do companies sell on price competition or quality? Threat of Substitution – Do customers need the specific product or can they use something else that will fulfill the same need? How urgent is it that someone buys the product when they first realize the need? Customers of medical products may not buy frequently but they often need a specific product and they need it urgently. Doing your market research can take months but you will become an expert in the industry. Don’t just use one source for your market research and make sure you fact check everything you find on the internet. Detailing your market research may seem tedious at times but it will be a key factor to your success and a requirement for getting funding. Surveys and focus groups – Don’t avoid getting information from potential customers and suppliers. It might be more expensive but it will be direct from the people that know. Publicly-traded companies – These companies might be much larger than other competitors but they are required to file reports that will discuss the key issues in the market. Detailing your market research will uncover a lot of opportunities for your product and risks from competition. Once you know how the market functions, you can develop a marketing strategy to take advantage of the opportunities. Marketing strategy is often separated into the Four Ps: product, price, promotion and place. You’ve already put together the ideas around your product within market research but you’ll need to develop a strategy around the other three. Promotion is generally the different ways you will market your product and special strategies. Is there seasonality to your product’s demand or events around which you can promote? If your product is highly complementary of another product, meaning people usually use the two together, you might want to try promoting it in association. How and when do your competitors run their promotions? Can you take advantage of massive advertising by competitors to grab customers at the last minute while they’re out shopping? If competitors are already spending money to get people to the store, try spending your marketing at the store. Should you run your promotions at the same time as competitors or wait until competitor discounts have finished? Place relates to where your customers buy the product, i.e. online, phone or traditional store. Is the product usually sold through a specialty store, a supermarket or a department store? Do you need a dispersed sales force or can a few agents sell the product directly to customers? Will you sell it continuously or do most sales happen sporadically at trade shows and special events? If most of your sales happen sporadically, you might be able to cut down on operating costs by only being a seasonal business. Price is will depend on the market and your own sales strategy. Again, it is usually much better to compete on some differentiation of your product rather than to be the low-cost producer. 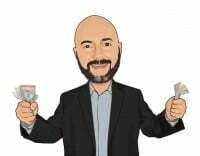 Being able to sell something for cheaper isn’t really much of a special skill and you’ll have a tough time convincing investors your business plan is sound. Is there a gap in existing competitor pricing, i.e. is there a gap between low-cost products and the luxury market? How sensitive to price increases is the customer? Do customers pay attention to prices and is a small increase over competitors’ pricing going to be noticed? If one or a few customers have the potential to be big buyers, can you offer a special discount? Part of your pricing is also going to depend on your own costs and financing needs. Angel and venture capital investors will generally want to see an annual return above 20% for the company. How high do prices need to be to accomplish this return? Online retail sales are growing at double the rate of traditional store sales. Online sales are expected to grow by 9% a year through 2017 compared to just 4% growth in traditional sales and still have a lot of room to grow. Even if you only sell to a local market, having an online presence can be a huge boost to your business. You’ll get the chance to connect with your customers continuously and on a more personal level. You’ll also be able to start building an online community around your brand, something that will be essential in one of the funding resources we’ll talk about later. The operations section of your business plan is going to describe how you plan to physically produce and deliver your product or service to customers. It outlines specific responsibilities of managers, the funding needed to start up operations and ongoing expenses. Are costs fairly steady from start-up through production or do costs happen more sporadically? You’ll develop your funding needs in more detail later in the business plan but you want to tie them directly with operations here. What is the minimum costs to start operations and for the base scenario of sales? Make sure you cover different scenarios of sales. If you have many more orders than you expect, how quickly can you hire staff and increase production? Are there other suppliers you can go to for bulk ordering and how long does it take to produce the supplies you need for your product? How long does the supply chain and production process take in your industry? If sales are slower than expected, will there be risk of spoiling or shifts in fashion trends? How deeply will you be able to discount your product to get it out the door? New business owners often jump into an idea without thinking through business structure and staffing questions. The smallest sole proprietorships may start in your home office but you have to plan for what you’ll need to grow. Are you planning on double- or triple-digit sales growth but not planning on the workload involved? Even if you are planning on running a one-person show for the next couple of years, it’s best to start making the connections you’ll need for future growth. Who knows, you may need additional staff sooner than you think. Start by finding freelancers that can provide ad hoc services when you need them. It can take a while to find quality freelancers so put together a few small projects early to test out a few providers. Start thinking about what tasks you do regularly that could be outsourced to an assistant. Always balance quality and cost with your work. You may be able to design your own graphics but can an expert do it much faster and at a marginal cost? You’ll also want to write out your relationship with large suppliers and potential alternatives. What happens if your sole provider gets acquired by a competitor or goes out of business? What happens if you get a rush of orders which can’t be handled by a current supplier? When you start seeking funding from investor groups, you’ll need to be able to show depth of experience in your management team. If you can demonstrate that people on your management team have been successful in the past, you’re much more likely to get and investor’s attention. If your core team doesn’t have much experience, consider bringing on a few experts as consultants and offering them a limited stake in the company. The quality of your market research will be critical to other parts of your business plan so don’t skimp on time or money. Double-check all information you get from third-party sources or on the internet and seriously consider doing some of your own research through focus groups and surveys. Always, always have at least one or two people review your business plan. You’re just too close to the material to be able to critique it or find errors. Try getting a review from at least one person outside your team for a more independent review. Your business plan doesn’t have to be perfect before you get your business off the ground. Too many entrepreneurs get analysis-paralysis and get bogged down in the details. 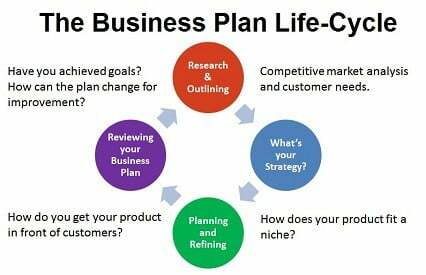 Put some time into creating your business plan and then get going! Writing a business plan may seem unnecessary, especially when you really just want to start running your business. 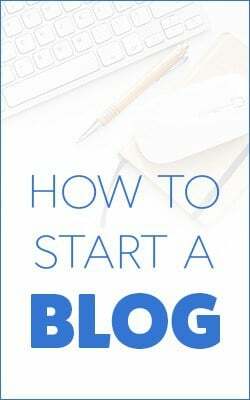 But for you to be successful in raising money and getting people interested in your idea, writing and updating a business plan for your company is a must-do.